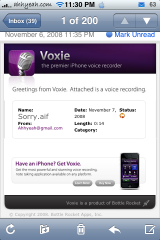 Voxie is a very nice, smooth voice recording application. Some of the better features are organization of recordings and the ability to email the recordings to anyone in your contact list. It sends in and .aif format that the iPhone can read. There are a lot of options in the “Settings” tab which make the app very customizable. You can easily see details like date, time, length and file size and there’s even a visualizer showing what the recording “looks” like. If all of this seems confusing or complicated you can just tap on the “Express” tab and just one tap or a shake starts the recording. One more tap saves it and it becomes ready to record again with just another tap. 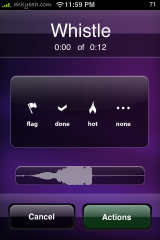 With clean design and options for recording qualities from 8kHz to 44kHz this app is worth the price. One thing that I had trouble figuring out at first is to save a recording you have to tap “Actions” and then “Save Only”. At first I thought the “Actions” button just allows for emailing. 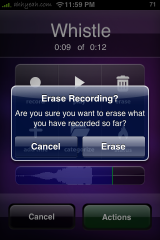 App to record called ? 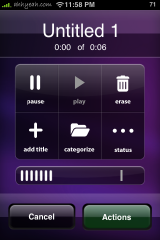 Absolutely great app. 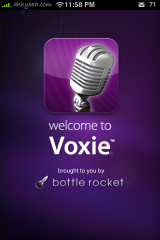 Just got Voxie after reading this. Best looking interface of the bunch. and epxress mode is very cool. 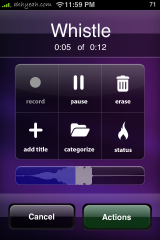 shake to record. genius. 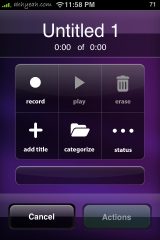 If the Microphone’s display reaches or exceeds the set threshold, the previously defined phone number will be called. After completion of the call and the expiration of the delay Babyphone will reactivate itself again. 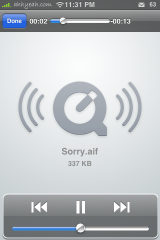 Do NOT try to use slashes (/) in recording titles (aka filenames). 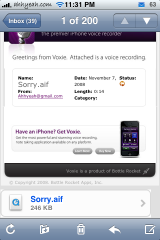 can u use this as a voicemail option? For instance if I record my voice to customize a “ring” could I use that “ring” or alert for an option of a voice-mail alert? 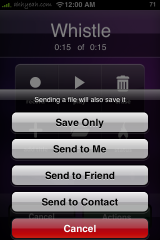 I am trying to use the send to me feature on the express record…however it does not send to me. 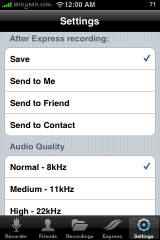 I do not get my recordings…can anyone help me out on this? i am new at wi fi . 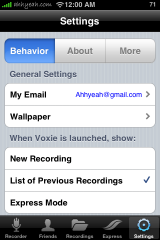 How do i send my large voxie recordings to a contact using it ?